Beans are a great source for protein. Their DRI (Dietary Reference Intake) is 0.8 grams of protein per kilogram of body weight, or 0.36 grams per pound. This amounts to: 56 grams per day for the average sedentary man and 46 grams per day for the average sedentary woman. How does this translate to real life? Thus four cups of beans provides most men with their minimum daily requirement for protein and three cups of beans provides most women with their daily requirements for protein. Yes, meat is a more efficient source of protein if you consider that only one cup of beef yields 62 grams of protein. However, that one cup of beef does not provide all the health benefits yielded from one cup of beans and even more importantly, that one cup of beef takes a toll on the environment. Wait a minute! How can a person eat beans the livelong day? I learned with a little creativity from the cook that beans offer a great variety for the palate. I came across a cookbook that mysteriously appeared in my living room. Truly, I have no idea where this book came from but so many people come and go in my home, the possibilities for its source are almost endless—that and in addition to the fact that I lead a magical life with countless unexplained mysteries and gifts—there is just no telling where that cookbook came from. It is titled “From the Queen’s Kitchen—a Collection of Pinto Bean Recipes and more from Cortez, Colorado. It has 145 pages of recipes featuring pinto beans. For example to name a few: Coconut Bean Pie; Ice Cream Sauce (made from pinto beans); Vegetarian Bean Squares; Bean Cheese Swirl; Southwestern Cheese Cake; and about 400 more bean recipes. Perhaps beans have more possibilities that I thought. It’s a scientific fact: Nutritionally, Beans are a better choice than meat. In addition to being a good source for protein, beans are rich in fiber and complex carbohydrates. They have a low glycemic index which makes them an ideal food for managing insulin resistance, diabetes and hyperlipidemia. Most types of beans are good sources of potassium, a mineral that promotes healthy blood pressure levels. Beans are excellent sources of minerals that we don’t get enough of: copper, iron, phosphorus, manganese and magnesium. Dry beans also contain the water-soluble vitamins thiamin and folic acid as well as riboflavin and Vitamin B6. A study published in the Archives of Internal Medicine confirms that eating high fiber foods, such as pinto beans, helps prevent heart disease. Almost 10,000 American adults participated in this study and were followed for 19 years. People eating the most fiber, 21 grams per day, had 12% less coronary heart disease (CHD) and 11% less cardiovascular disease (CVD) compared to those eating the least, 5 grams daily. Those eating the most water-soluble dietary fiber fared even better with a 15% reduction in risk of CHD and a 10% risk reduction in CVD. When there is enough magnesium in the body, veins and arteries relax, which lessens resistance and improves the flow of blood, oxygen and nutrients throughout the body. Studies show that a deficiency of magnesium is associated with heart attack. The effectiveness of potassium-rich foods such as beans in lowering blood pressure has been demonstrated by a number of studies. Yes, pulses (dried beans) can greatly enhance weight loss. Scientists at Purdue University and Bastyr University asked volunteers to consume 30 percent fewer calories than usual, randomly assigning dieters to one of three eating plans. The first plan included 3 cups of beans and lentils, or pulses, per week, the second included nearly 2 cups of pulses a day for women and 3 for men, and the third included minimal amounts of pulses. After six weeks, all three groups lost weight, but the dieters who consumed the most pulses shed the most pounds. The thrice-weekly bean/lentil eaters lost 7.5 pounds, those on the pulse-loaded diet lost 8.5 pounds, and those with the minimal pulse intake lost just 2 pounds. British Journal of Nutrition, tracked overweight women with high cholesterol who, twice a day for 28 days, received muffins containing either whole pea flour (equivalent to ½ cup of pulses), fractionated pea flour (hulls only), or white wheat flour. At the end of the study, the women who ate the muffins with the whole pea protein powder had the lowest waist-to-hip ratios, indicating that fat was directed away from the waistline. Previous animal research compared rats fed and unhealthy diet with or without added chickpeas to rodents that ate healthy fare. The chickpea-eating rats had significantly reduced belly fat and had blood sugar and insulin levels similar to the animals fed healthy food. BACK TO LOCAL WHERE ALL THINGS LARGE AND SMALL MATTER. So how does this all bean talk relate to Local Garland and my Local Yokel Life as a Loving Garland Green member and one of the stewards of the Garland Community Garden? I can trace the winding roots of my seemingly serendipitous bean path back to late April of 2016 when I read somewhere that the United Nations had declared 2016 as the “International Year of Pulses”. The objectives of that declaration included raising awareness about the important role of pulses in sustainable food production and healthy diets. Also included in the UN objectives was the desire to encourage connections throughout the food chain to further global production of pulses and address challenges in the trade of pulses. In August of 2016 I was thinking about and planning what we would present at our annual Garland Health Expo that was being held at the Curtis Culwell Center. 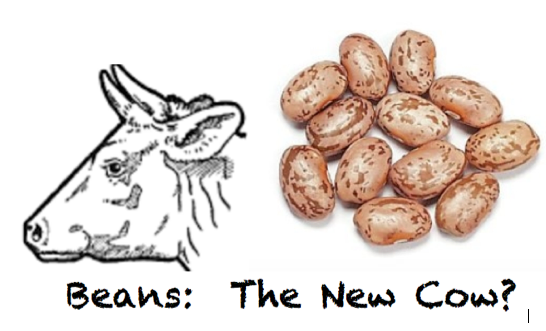 I decided that beans would be a good topic. I made a pot with a cane tripod trellis and planted green pole beans in it. We used it along with “magic” green bean packets of seed that we gave away to the public. These seeds were from beans that we had grown at the garden. After the Health Expo we donated the bean pot and trellis to Watson, one of our magnet schools here in Garland, Texas. I am fairly certain that beans will take a place on my edibles shelf of honor with blackberries and kale—three other fabulous sources of nutrition that meet my basic requirements when it comes to choosing plants for my garden: 1) Must be able to fend for themselves with little care and 2) must provide great nutrition. Blackberries, kale, sweet potatoes and beans all grow well in our DFW area and once established, except for harvesting involve minimal care and attention. Bean Mania, especially pole bean mania is spreading in Garland. In the first part of April we installed eight 27-gallon pots of beans with trellises at the Garland Good Samaritans headquarters. Then on April 13, we installed four cane poles in one of their existing flowerbeds and planted pole beans there too. We wanted to demonstrate that you don’t have to dig up half your yard (although you can) to have some homegrown vegetables. They don’t mind sharing the bed with a few petunias. Urban farming can be undertaken at all levels in Garland, Texas—from taking over a vacant lot (with City permission on City land) to planting Kale and a few beans in your flower bed. Down at the garden I’ve created a bean patch with about 8 different varieties of pole beans already growing. In addition the North Garland High School Environmental club have a 27-gallon trellised pot that is growing beans. 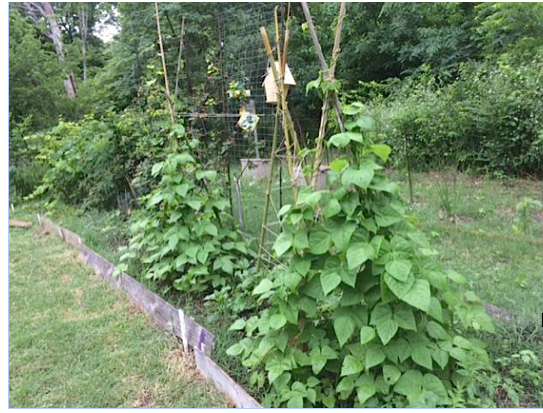 We also installed two bean tripod trellises in our Children’s Garden. It’s nearing time to empty out the compost from the large teepee in front of the garden. I’ll be undertaking that next week. The compost will be used to expand our pollinator garden. It will be interesting to see its state of decomposition as I layered a lot of manure into the leaves and watered it regularly from November until April. Even if it is not sufficiently decomposed to be called “soil”, it will still be the base for the extension of “Pollinator Heaven”. We will put mature compost on top of that and then a little garden soil to top it off. The cloth will be removed from the teepee and the frame will become a giant bean trellis. By July it should look like a giant evergreen. I’m looking forward to seeing it.